It was about 10am before we finally got on the road. The reason was that the solar panels were filthy so I gave them a bit of a clean after we had lowered the roof. It was a lot easier that way. 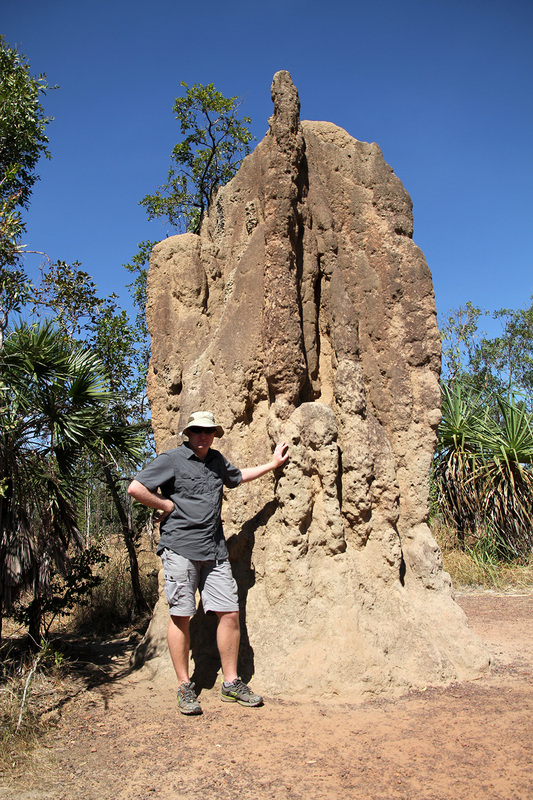 First stop was the magnetic termite mounds in Litchfield National Park. 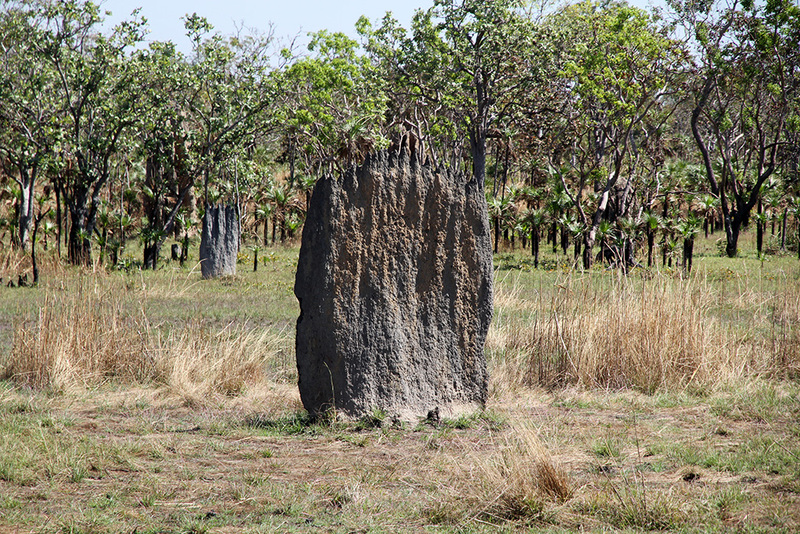 The termite mounds are built north south to minimise exposure to the sun. There are also some Cathedral termite mounds there as well. 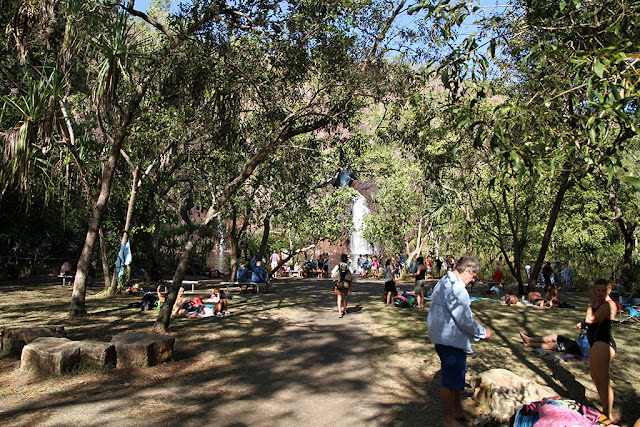 It was then on to Florence Falls. Because it was lunch time and so busy, (it was hard to find a park with the camper on), we couldn't really be bothered walking all of the way down to the bottom of the falls for a swim. 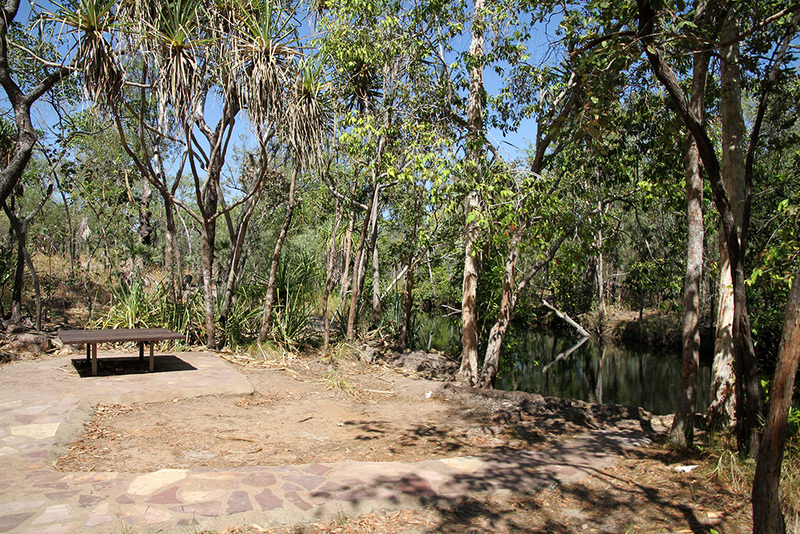 So we found a nice spot beside a creek for lunch. After lunch we headed to Litchfield Safari Park on the other side of the national park. We setup camp and then headed off to Wangi Falls for a quick swim with the hundreds of other people. 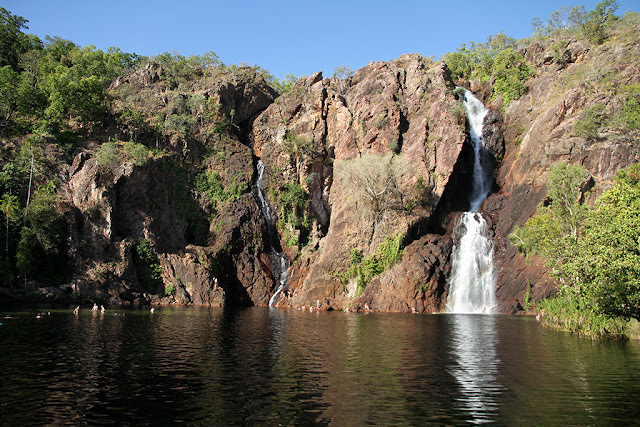 Certainly not as peaceful as at Gunloam Falls. On returning to camp we found that uncommon sense is alive and well. These people basically set up camp in our access to camp site. I had to ask them to back up their vehicle so that I could reverse into our camp site. My front tyre and bull bar would have come about 10cm from their tent as I was reversing in. How do they think the camper got in there in the first place? Do they think it just teleported in? 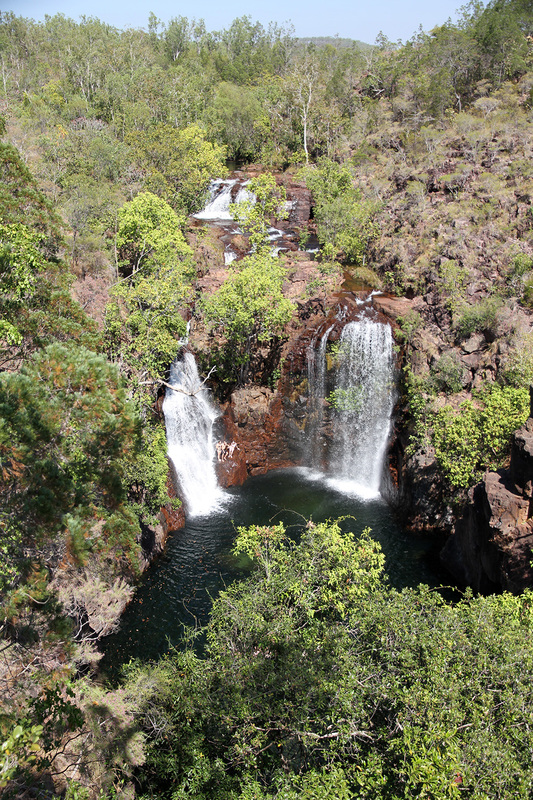 This also happened to us at Cooinda Lodge at Yellow Water hole. A car load of Taiwanese backpackers set up their two two person tents pretty much right in front of our draw bar when we were out. I think they got the message to pack the tents up quick smart when I had the Pajero idling over just before we were hitching up. The engine would have been about 30cm from the tent! As I was hitching up, a little old Taiwanese lady was so interested in me hitching up it was un-nerving. She was pretty much standing right beside me to see what I was doing as I was trying to get the couplings together. She said that over in Taiwan nobody has any sort of camper trailers, caravans etc because they just don't have the space to store them. That is probably why they felt completely comfortable camping right on our door step. 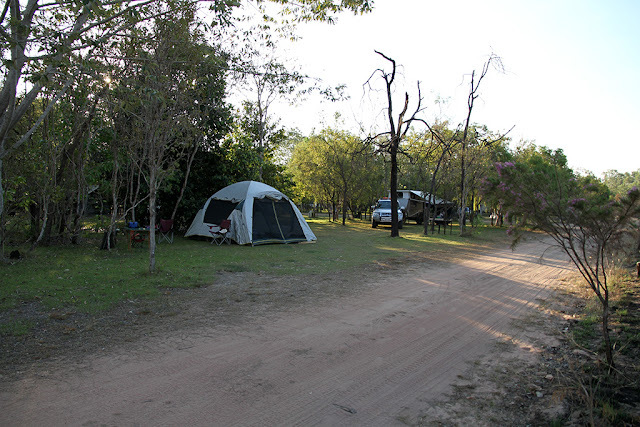 We have come to expect that camping in the unpowered sections in the popular camp areas can lead to turf wars!